Shows: Saban's Adventures of the Little Mermaid, The Little Mermaid. 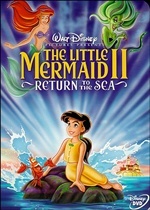 Movies: Hans Christian Anderson's The Little Mermaid, The Little Mermaid: Ariel's Beginning, The Little Mermaid. Games: The Little Mermaid: Ariel's Majestic Journey, The Little Mermaid II: The Video Game.